Birdies for Charity is a fundraising program designed to give charities, like Ronald McDonald House Charities of Alabama the opportunity to raise funds by generating contributions based on the number of birdies made by PGA TOUR Champions players at the Regions Tradition here in Birmingham. Fans have the chance to make a guess of the total number of birdies made by Champions Tour players during the 2016 Regions Tradition. You can also just make a flat pledge (not “bidding” on the number of birdies). To donate, go to the Birdies for Charity Donation page by clicking here. When you make a donation to PGA TOUR Charities, 100% goes directly to the charity of your choice. The charities who raise $1,000 or more will receive a minimum 6% match through the SouthWest Water Company Matching Funds Program. Therefore, this is an opportunity to raise additional funds for the House — but we must reach that $1,000 minimum in order to get the matching funds. We are not there yet, but with your help, we can reach this minimum. There are a lot of added benefits for the charity and the donor! Each week, a donor is selected at random for a raffle item. Your donation could get you a gift card or a signed hat (among 100’s of other prizes). RMHCA has also had additional opportunities through the program, like the chance to set up a table at the Regions Tradition. If you are in attendance on Saturday, please stop by our tent to learn more about our cause through this promotion. 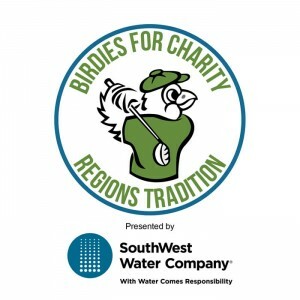 Learn more about Birdies for Charity on the Regions Tradition website. You can donate toward RMHCA now on the Birdies for Charity site.